A profusion of new aircraft types came upon the fighter scene in the 15 years between the end of World War II and 1960. Many of these  did not progress beyond the prototype stage; others entered production and became part of the fighting inventory of the U.S. Armed Forces. As discussed, many new design innovations were explored in this seminal period jet-fighter design. By the end of the 1950's, however, most of the new concepts had been explored, and the days of rapid design and construction of new prototypes were at an end. A major contributor to the demise of the multiple prototype approach was the great complexity and associated high development cost of any new fighter by the 1960's. Consequently, only three new fighters came into the USAF and Navy inventories in the 1960's. Of the three, the McDonnell F-4 and the Northrop F-5 series of fighters incorporated no really new design concepts but were carefully engineered combinations of proven design features aimed at achieving specified mission capabilities. The third aircraft of this group was the General Dynamics F-111; it enjoys the distinction of being the first production aircraft of any type in any country to have a variable-sweep wing. These three aircraft, which are still in service, are discussed below. If the number of aircraft produced is any measure of success, then surely the McDonnell F-4 aircraft must be considered the most successful supersonic fighter ever produced in the United States. From the time of its first flight on May 27, 1958 until the end of production in 1979, slightly over 5000 F-4's of approximately 15 variants were produced. Originally developed as a carrier-based fleet-defense fighter for the Navy, the F-4 (F4H in the old Navy designation system) was designed to have higher performance and a larger and more versatile weapons load than the F-8, as well as complete all-weather capability. The F-4 Phantom II first entered Navy service in late 1960, and in 1962 the USAF began procurement of the F-4 for service in its fighter squadrons. Today, the aircraft serves in the air forces of 10 foreign countries, as well as with the USAF, Navy, and Marine Corps. 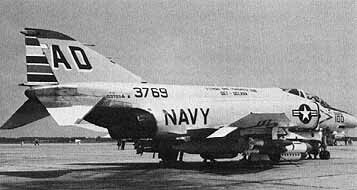 A three-quarter front view of an Air Force RF-4C (reconnaissance version of the aircraft) is shown in figure 11.21; a three-quarter rear view of a Navy F-4J fighter is presented in figure 11.22; and a sketch of the wing planform shape is given in figure 11.23. Details of the physical and performance characteristics of the USAF F-4E are given in table V.
 Figure 11.23 - Approximate wing-planform shape of McDonnell Douglas F-4 jet fighter. ....mounted on an aft fuselage extension above the nozzles. As indicated by early wind-tunnel studies, the resultant high position of the horizontal tail in combination with the wing-shape parameters led to undesirable nonlinear pitching-moment characteristics at high angles of attack. The large anhedral angle, or droop, of the horizontal-tail surfaces greatly improved the pitching-moment characteristics, as well as increasing directional stability. To achieve the proper balance in dihedral effect for the integrated aircraft configuration, however, a large positive dihedral angle was incorporated in the outer panels of the wing. In addition, the wing dihedral elevated the wingtip vortexes relative to the horizontal tail and further improved the pitching-moment characteristics of the aircraft. Another identifying feature of the F-4 is the large vertical-ramp variable- geometry inlet located on each side of the fuselage. These inlets feed the two 17 900-pound-thrust afterburning General Electric turbojet engines. Contained in reference 155 is an interesting paper by Bennett and Rousseau that describes seven different wing configurations used on the F-4; the reader should consult this paper for details of these various wings. The planform of the low-aspect-ratio 45° sweptback wing is depicted in figure 11.23. Different combinations of leading-edge flaps and slats, together with trailing-edge flaps, were used on various versions of the aircraft. As a result of combat experience in the Vietnam conflict, the leading-edge slats shown in figure 11.23 were incorporated  to improve manuevering capability in air-to-air engagements. Leadingedge and trailing-edge boundary-layer control using high-pressure engine bleed air was provided on Navy models of the aircraft (as well as some USAF versions) to give the desired low approach speeds so necessary in carrier operations. 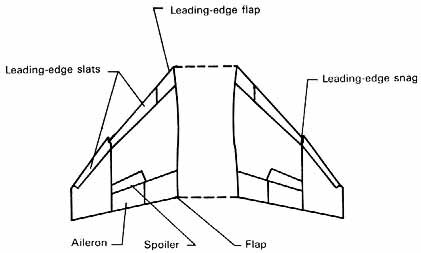 Lateral control was provided by a combination of upper-surface spoilers and midspan ailerons. Thickness ratio of the wing varied from 6.4 percent at the root to 4 percent at the tip. Originally intended as a fleet-defense fighter, the F-4 had no guns but was equipped only with missiles. Four Sparrow missiles with a 10mile range and four Sidewinders with a 2-mile range were semiburied on the lower side of the aircraft beneath the wings and fuselage. Navigation and target acquisition was handled in the all-weather aircraft by the radar intercept officer seated behind the pilot. All Phantom II aircraft were of two-seat configuration. As later used in the ground-attack mode, a wide variety of external stores could be carried. For example, two 370-gallon fuel tanks could be mounted on inboard wing pylons, together with a 600-gallon centerline tank. On a typical ground-attack mission, six 750-pound bombs could be delivered at a combat radius of 514 miles at an average speed of 566 miles per hour. Four air-to-air missiles were also carried, and about 42 percent of the total fuel load was accommodated in external tanks. As a result of Vietnam combat experience, a Vulcan six-barrel 20-mm cannon was added to the armament of the F-4 to increase its effectiveness in the air-superiority role. A glance at the data in table V indicates that the F-4E was a large, heavy, twin-engine aircraft with Mach 2.25 supersonic performance coupled with a sea-level rate of climb of 54 200 feet per minute and service ceiling of 59 200 feet. As compared with earlier Century Series fighters, however, the F-4 had a relatively high zero-lift drag coefficient and low maximum lift-drag ratio. Once described in the press as a triumph of thrust over aerodynamics (with at least some degree of truth), the F-4 was nevertheless an astute ensemble of aircraft design parameters synthesized in such a way as to produce an outstanding fighter. Extensive service in Vietnam clearly showed that the aircraft could be employed effectively in a wide variety of roles encompassing most missions a fighter might be called upon to perform. The high performance of the Phantom II coupled with its great versatility and twin-engine reliability have resulted in its wide acceptance throughout the world. It will be a familiar silhouette in the sky for many years to come. The various models of the aircraft as well as a summary of its war record may be found in reference 200. A fighter totally different in concept from the McDonnell F-4, but one that has received worldwide acceptance, is the Northrop F-5 family of fighters. Today, this versatile aircraft serves in the air force inventories of 27 countries. It is a lightweight, easy-to-fly, simple-to-maintain, and (relatively) cheap supersonic fighter that was selected in the early 1960's for use by underdeveloped countries as part of the U.S. Military Assistance Program (MAP). Its origins can be traced to design studies begun by Northrop in the mid-19501s; development proceeded along two lines. In response to a USAF requirement for a supersonic trainer, the two-place T-38 Talon was produced. First flight took place on April 10, 1959, and eventually 1189 of these aircraft were manufactured for use by the USAF, the Navy, NASA, and the Federal Republic of Germany. Most of these were delivered by the mid-1960's. In addition to its trainer and pilot proficiency roles, the T-38 was flown for a number of years by the USAF Thunderbird exhibition team. ....continues at this writing. An advanced version of the aircraft, known as the F-20 Tigershark, is now under development. A three-quarter front view of a Northrop F-5A Tiger can be seen in figure 11.24, and an in-flight view of its close relative, the T-38 Talon supersonic trainer, is shown in figure 11.25. Physical and performance characteristics of the F-5E Tiger II are contained in table V.
In configuration the F-5 is a low-wing monoplane equipped with an all-moving horizontal tall mounted in the low position; the fuselage is carefully contoured in accordance with the transonic area rule. Small side-mounted inlets supply air for the two General Electric J85 afterburning turbojet engines. The 4.8-percent-thick wing has 24 sweepback at the quarter chord line. As can be seen by the T-38 in figure 11.25, the wing trailing edge is nearly straight, giving a trapezoidal shape to the planform. Lateral control is provided by small ailerons located near midsemispan; single-slotted high-lift flaps extend from the inboard end of the ailerons to the sides of the fuselage. Leading-edge flaps are used to improve maneuvering performance. (These flaps are not incorporated in the wings of the T-38.) As can be seen in figure 11.25, speed brakes are mounted on the bottom of the fuselage. Turning performance is enhanced by an aileron-rudder interconnect system, and handling characteristics are improved by artificial damping about the pitch and yaw axes. The F-5 is reported to have good handling characteristics and, in contrast with the F-4, does not have a propensity for entering unintentional spins. A glance at the data in table V shows that the F-5E is indeed a small, light aircraft. Its design gross weight of 15 745 pounds is only about 30 percent of the 53 848-pound design gross weight of the F-4. In performance, the F-5 has a Mach 1.51 capability at about 36000 feet and a sea-level rate of climb of 28 536 feet per minute - a good performance but not comparable with that of the F-4. Certainly, the load-carrying capability of the F-5 is much less than that of the larger aircraft. Like the McDonnell F-4 Phantom II, the F-5 Tiger will be a familiar sight in many parts of the world for a long time to come. An interesting account of the development of the F-5 and T-38 is contained in reference 134. In 1960 the USAF formulated requirements for a new all-weather fighter-bomber to replace the Republic F-105. An aircraft that combined transatlantic ferry capability, short-field landing and takeoff, and both subsonic and supersonic attack modes was desired. Such a great mission flexibility was made possible and feasible by the newly developed NASA single-pivot, variable-sweep wing concept described in chapter 10. At the same time, the Navy had a requirement for a new combat-air-patrol aircraft that could loiter for long periods of time at a distance from the fleet and have the capability of preventing any intrusion of hostile aircraft within a specified zone surrounding the fleet. In the summer of 1961, the new Secretary of Defense decided that, to reduce program costs, a single aircraft to satisfy both Air Force and Navy requirements was both possible and desirable. Competing for the  contract to develop this entirely new type of aircraft were Boeing and General Dynamics, with Grumman as a subcontractor for the Navy version of the aircraft. General Dynamics was selected as the winner of the competition in December 1962. The source selection and subsequent development and early operational use of the F- 111 were fraught with technical problems and political controversy. No discussion of these difficulties is offered here other than to note that the variable-sweep wing itself caused no problems. First flight of the F-111A, the Air Force version of the aircraft, took place in December 1964, and the Navy version, the F-111B, made its initial flight about 5 months later. Unfortunately, the decision to develop a single aircraft to satisfy both USAF and Navy requirements compromised both versions of the aircraft. To satisfy the low-level supersonic range requirement of the Air Force, a long slender aircraft of high fineness ratio was required to give the desired low level of supersonic wave drag. The length of the aircraft necessary to achieve the desired low wave drag, however, was incompatible with physical restrictions imposed by critical constraints of aircraft-carrier deck and elevator size. Consequently, the aircraft was shortened to meet Navy requirements. The consequent increase in drag resulted in increased fuel load and weight in order to accomplish even a much shorter than desired low-level supersonic range for the critical Air Force mission. Eventually, because of increased weight and degraded performance, the Navy withdrew from the program after the construction of only seven F-111B aircraft; the Grumman F-14, to be described later, was then developed to fill the role for which the F-111 was intended. The Air Force, however, continued with the program and, before production ended, took delivery of 563 aircraft including the FB-111 version for the Strategic Air Command. ....differentially for roll control as well as symmetrically to control pitch. Wing spoilers are used to augment the roll-control power supplied by differential deflection of the horizontal tall. 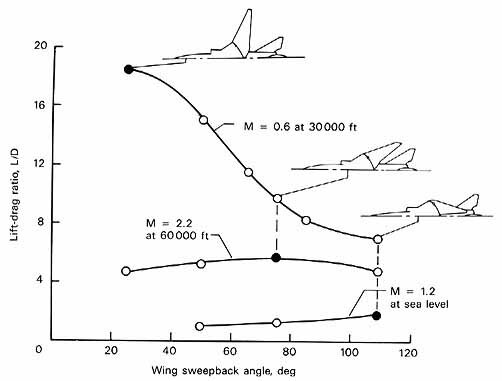 Wing sweepback angle can be varied from 16 to 72.5; the corresponding wing span varies from 63 to 32 feet. To assist in achieving short takeoff and landing (STOL) performance, the wing is fitted with leading-edge slats and trailing-edge double-slotted flaps. The very large wheels evident in figures 11.26 and 11.27 are to reduce footprint pressure and thus allow operation from semiprepared fields. 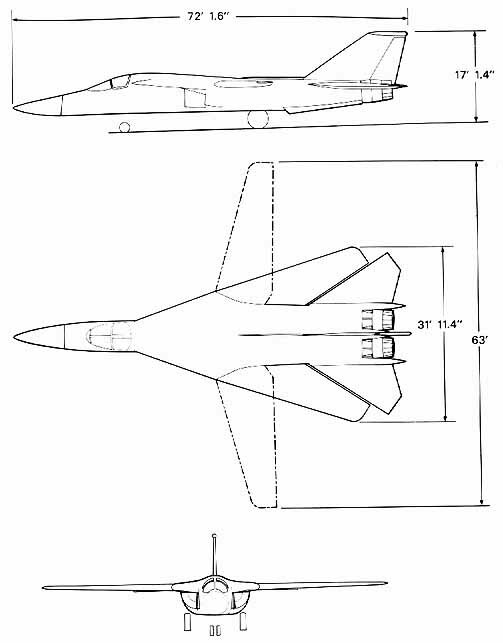 Figure 11.28 - Three-view drawing of General Dynamics F-111A twin-engine tactical strike fighter. The two crew members are seated beside each other in an air-conditioned and pressurized cockpit that forms part of an escape module. In the event that evacuation of the aircraft is necessary, the entire module separates and is lowered to the ground by parachute. A wide variety of weapons can be accommodated on the F-111. Included are an internal bomb bay for a nuclear device, a Vulcan sixbarrel 20-mm cannon, and provisions for externally mounting up to 20 000 pounds of stores - both weapons and fuel tanks. On the variable-sweep wing panels, the store-mounting pylons swivel so that the stores remain aligned with the airstream as the sweepback angle is varied. Precision all-weather attack capability is provided by a computerized radar coupled with an inertial navigation system. Terrain-following radar feeds signals into the autopilot so that the aircraft can fly up and down hills at very low altitude and thus minimize the risk of detection by enemy radar. In a typical low-altitude attack mission, a 2000-pound bomb can be delivered at a distance of 920 miles from home base. The trip to the target is made at sea level at a Mach number of about 0.5 with the last 44 miles being at a Mach number of 1.2. The return trip is accomplished at an altitude of approximately 34 000 feet and a Mach number of 0.75. ...wings.) For the ferry mission at Mach 0.6 and altitude of 30 000 feet, a wing sweep of 20° is optimum, whereas a wing sweep of about 75° is best for Mach 2.0 flight at 60 000 feet. If the sweep angle was to be fixed at 75° however, the subsonic lift-drag ratio and consequently the range in this speed regime would be cut in half. For Mach 1.2 at sea level, a sweep angle of about 110° appears best. Thus, by varying the sweepback angle, a single aircraft can be optimized for several widely different flight conditions. In addition to the important effects on aircraft performance just described, variable sweep can be used to control, at least to some extent, the magnitude of the gust loads imposed on the aircraft. As anyone who has flown in a transport aircraft knows, rough air is usually encountered more frequently at low rather than high altitudes. Mach 1.2 flight at sea level constitutes a particularly severe gust-loads environment, not only because of the frequency of gust encounter but because the magnitude of the load imposed on the aircraft for a given  size gust increases with speed. Minimizing the magnitude of these loads reduces structural weight and pilot fatigue and increases the accuracy of weapons delivery. Fortunately, the large sweep angles needed to reduce drag at supersonic speeds also reduce the magnitude of the gust loads. Finally, the low sweep position is useful in obtaining the maximum lift coefficients needed for STOL field lengths. The field lengths listed in reference 162 for the F-111 are less than 3000 feet. The F-111 first entered operational service In 1967 and saw action in the Vietnam conflict. This very versatile aircraft, though failing to meet some of its original performance objectives, is still an outstanding machine and is likely to remain in the USAF inventory for many years. An interesting account of the aerodynamic research that led to the F-111 concept is contained in reference 184.